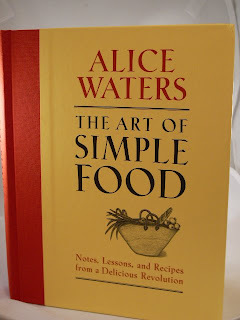 I saw Alice Waters' book, "The Art of Simple Food" in Costco about a year ago and was intrigued. But, I was not in the book-buying, food-making sort of mood at the time, so I passed on buying it. Well, I kept thinking about it here and there over the year and then saw it again in a shop in San Francisco's Ferry Building (aka a foodie's paradise) and again, it called to me. But this time the $35 price tag stopped me from taking it home. My good friends at Amazon.com came through at $23 and change and it was mine! Let me start out by stating I am not a cook. I make food in order to survive (my family, I'm sure, wishes it were different). Don't get me wrong. I love good food. I just enjoy eating good food, not making it. So, for me to recommend a cook book it pretty high on the WOW-o-meter. - the way it actually makes me want to cook!!!!! It's part cooking and food education, part cookbook and part art (in the recipes and the actual book). I figure if something has such an impact on me, I should share.